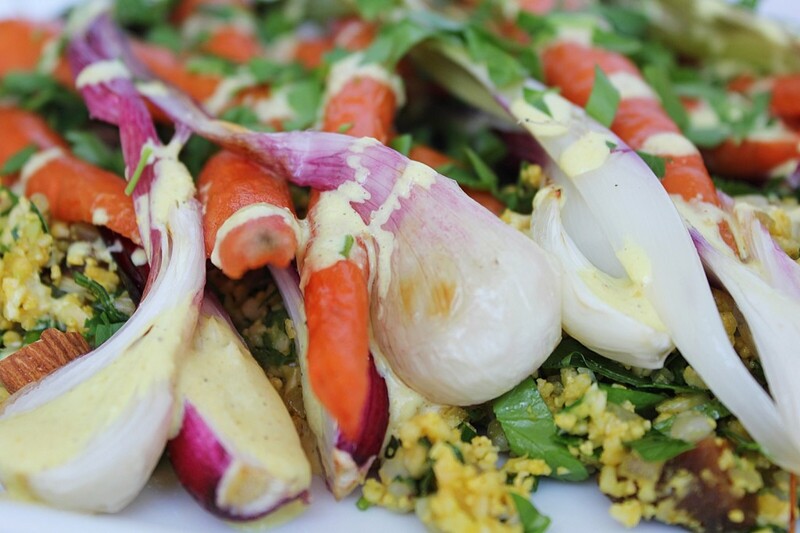 Finding out that cous cous is just pasta in a different shape was a big disappointment for me. This was before quinoa was a household name, and before I really cooked many whole grains (let alone knew about soaking them first), and I thought I was doing a good thing for my body by choosing cous cous over pasta. 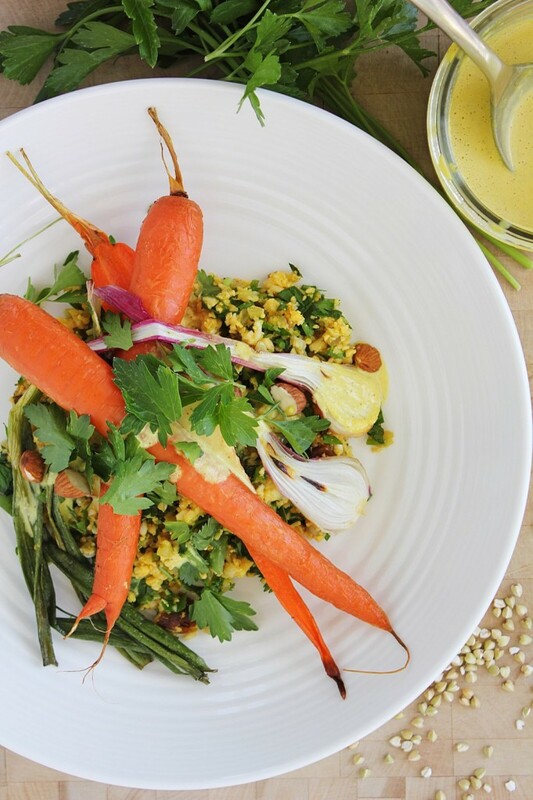 Once I learned more about whole grains and what on earth to do with them, I subbed in all kinds of grains for cous cous in related recipes, it’s actually a really easy thing to do, somewhat seamlessly. And then the cauliflower craze happened –cauliflower pizza crust, cauliflower ‘buffalo wings’, cauliflower mash –despite its overexposure, cauliflower still really excites me. 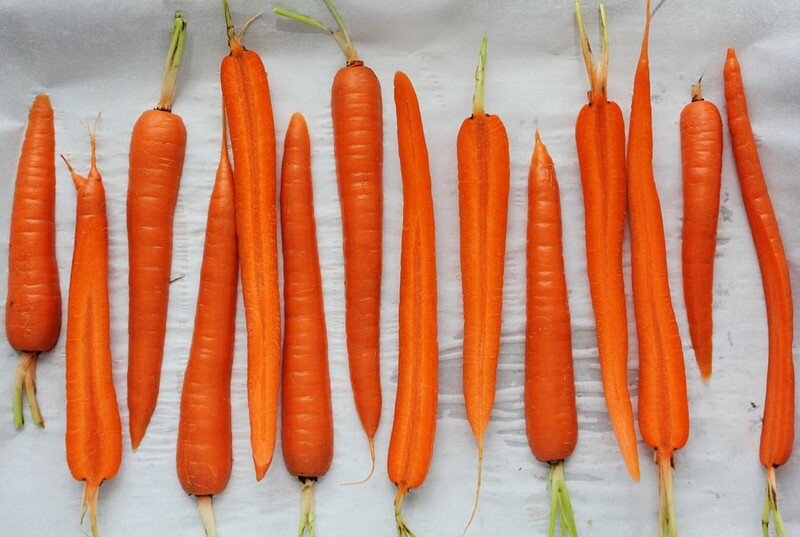 It isn’t a new vegetable, it has always been around, nutritious, affordable, available, but from a cancer-fighting perspective, it’s a miracle veg. It is from the cruciferous family (full of sulphur-containing phytonutrients that cleanse free radicals from the body), it’s low glycemic (won’t spike your blood sugar, won’t help cancer cells thrive), alkaline, and best of all, it tastes starchy and pretty easily replaces potatoes, pasta and flour-based foods, you just have to know what to do with it. We did this before, not too long ago with some Mexican flare. 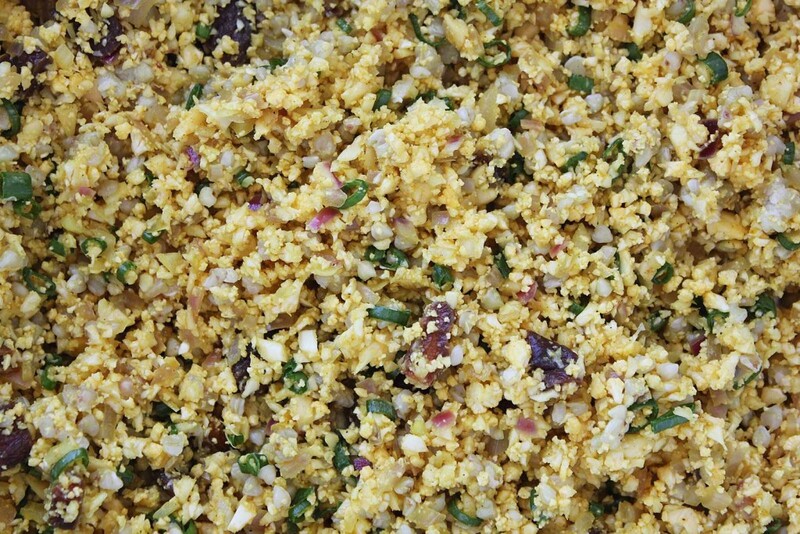 This time, instead of grating the cauliflower, we grind it up in the food processor until it resembles cous cous. It helps to give it a head start by chopping it up a bit, this way you will avoid any big chunks that don’t grind up properly, resulting in over-blended everything else. 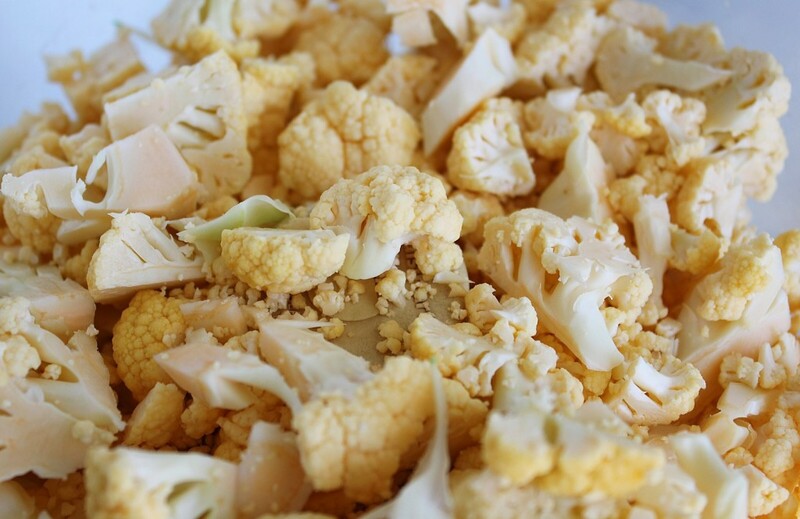 If you don’t have a food processor, grate it and then chop up the grated cauli even more. And then ask for a food processor for your birthday, it’s a game changer. 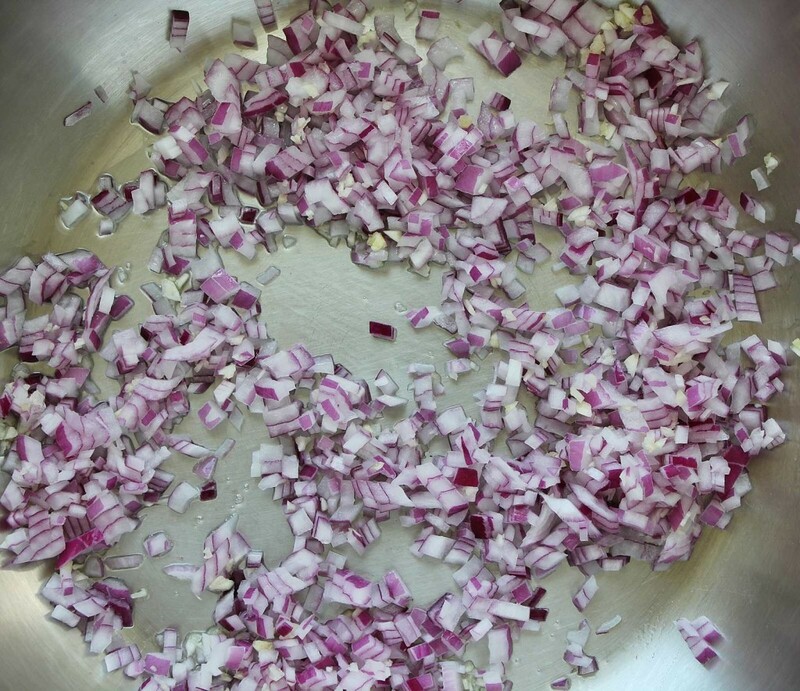 We cook the red onion and garlic, but if you choose to keep this dish entirely raw, just skip this step (it will be more intense). I have also added some cooked buckwheat in order to add a boost of protein, but this can also be eaten raw once soaked (a little sandier than when cooked, but not bad). I do prefer the cooked and raw combo though, just cook the onion and garlic, add the spices, and cooked buckwheat and then turn the heat off, leave it for a few minutes and then add the cauliflower and everything else. This tastes really good, the raw cauliflower has no squeaky, rubbery-ness the way you might expect, and it is basically salad but is comforting in a pasta kind of way. It also tastes great as leftovers, either cold or gently re-heated. If you have never cooked soaked buckwheat before, follow these quinoa instructions, it works the same way, but soak for half the time and rinse really well, it has an okra-like slime to it once soaked.Don’t let this deter you from using it, it’s delicious and has a really nice texture. Any seasonal veg, lightly roasted and served on top will work well in this dish –beets, fennel, broccolini, tomatoes, peppers, squash –literally, pretty much anything that looks good at the farmers market. 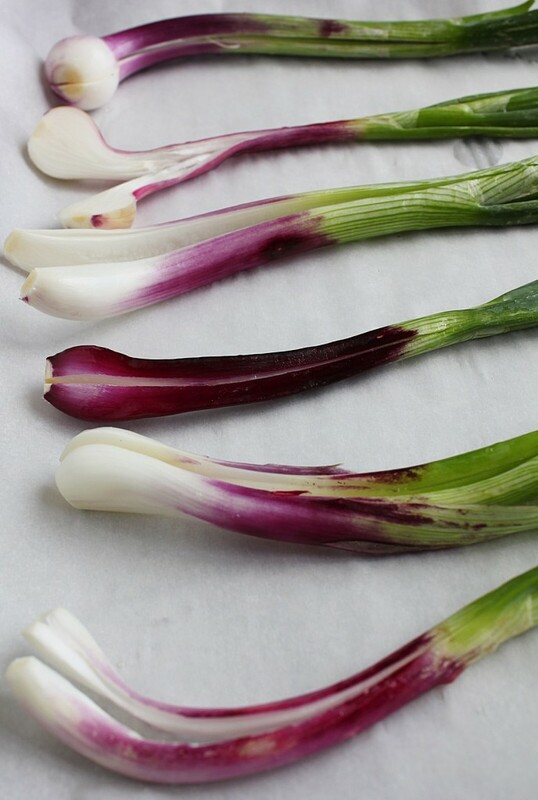 I’ve used carrots and some pretty purple green onions. This dish doesn’t need sauce, but if you are feeling ambitious, the tahini sauce takes this dish to the next level and gives it a nutty, earthy contrast. 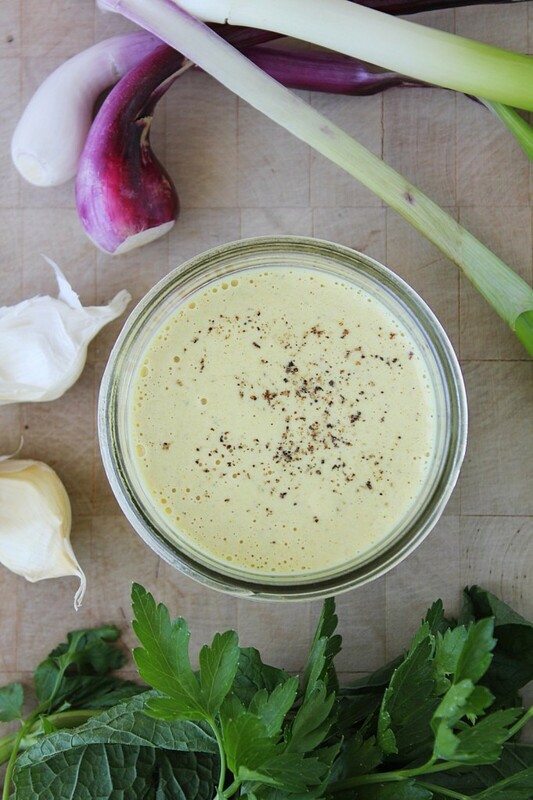 Everything else tastes bright and new and the tahini sauce tastes old and wise. My sister uses cauliflower in her tabouli in the same way we are using it here, in place of the bulgur. 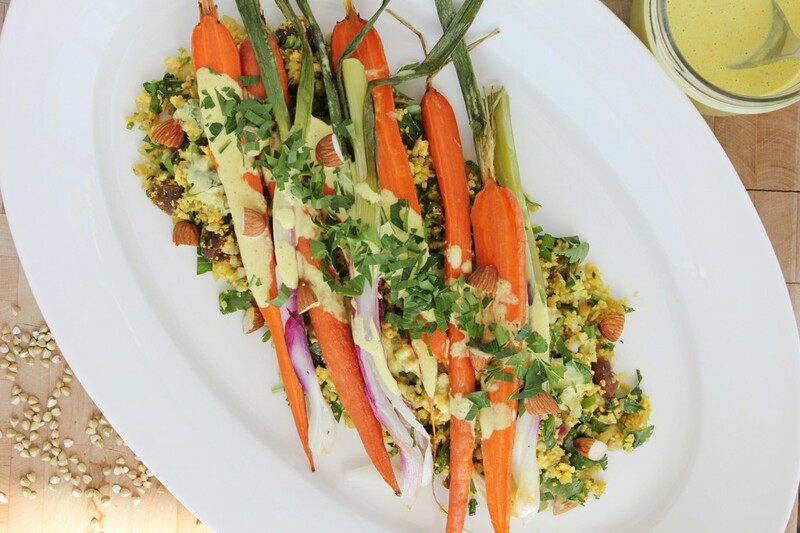 Give it a try in your grain-based salads (but don’t forget to leave in some clean, whole grains for protein content). This is one of the easiest ways to include real, actual vegetables (as opposed to living on avocado) in your diet without trying too hard. Bring soaked buckwheat to a boil, in enough water to just cover it, turn the heat way down and cover with a lid. It will take 5-10 minute to cook. 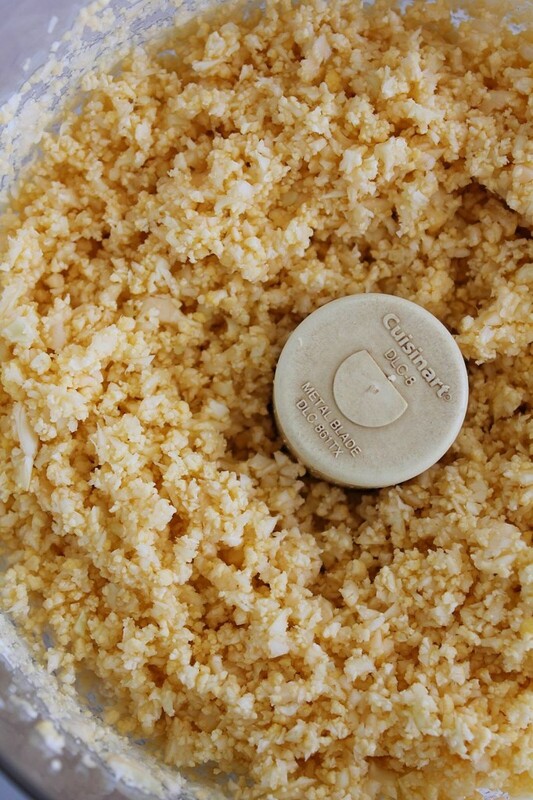 In a food processor, blend the chopped cauliflower until it resembles cous cous (don't over-blend it!) If you don't have a food processor, grated it or chop it finely by hand. In a large frying pan on med/low heat sauté the onion and garlic in the coconut oil until soft. Add the spices, sauté a little more and then add the cooked buckwheat. Top with the warm roasted veg and tahini sauce. Roast for 15-20 minutes or until everything has mellowed and softened but doesn't have too much colour. The onions will probably be finished before the carrots, so it's a good idea to bake them on different baking sheets or on separate sides so that you can remove them and put the carrots back in. 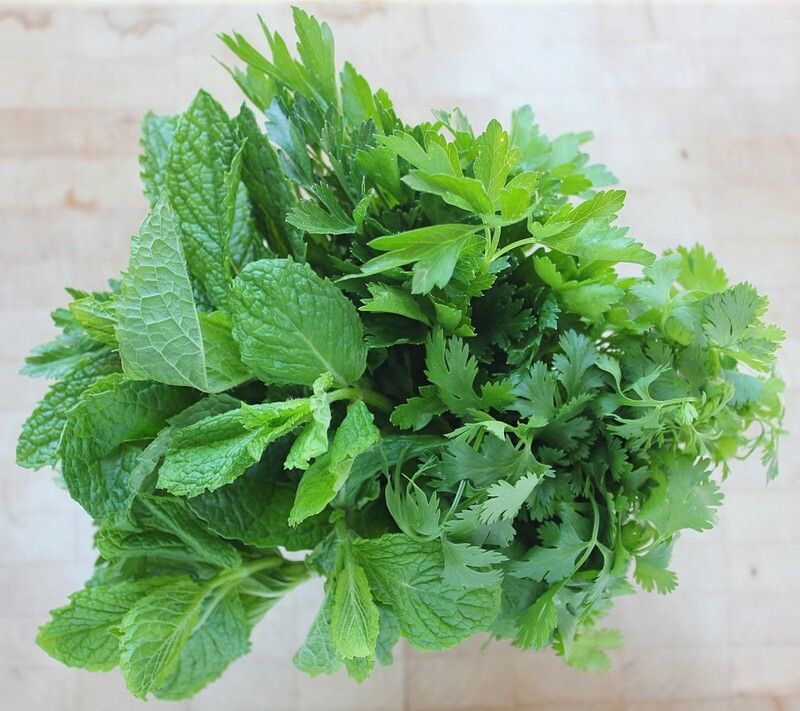 Blend all ingredients together with a hand blender or in a real blender.